The Bible is the road map for our lives as believers. We have some verses that will help guide you on this new journey. Joyce shares some helpful tips from her 40 plus years of helping others develop in their relationship with God. From getting a new Bible to understanding things like baptism and righteousness, we want to help you understand some of the basics of the Christian faith. We will share with you some tools that will help you develop in your walk with Christ. 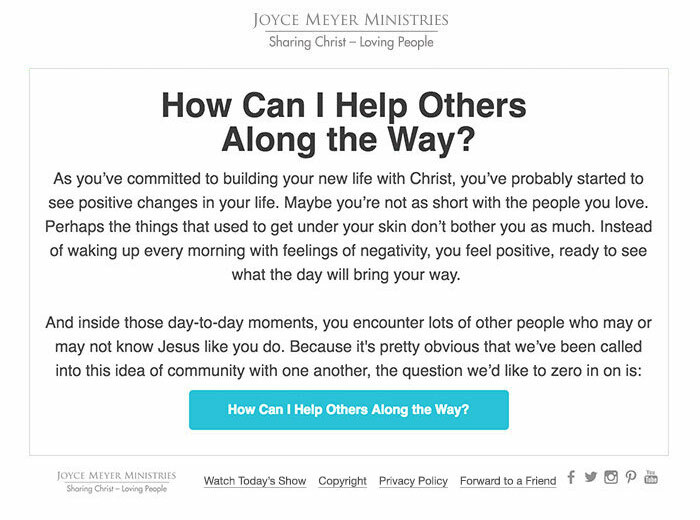 Each week we’ll send you an email to help you build a strong foundation in your new life with Christ. To sign up for weekly emails that will encourage you how to build your new life with Christ, simply fill out the form below.